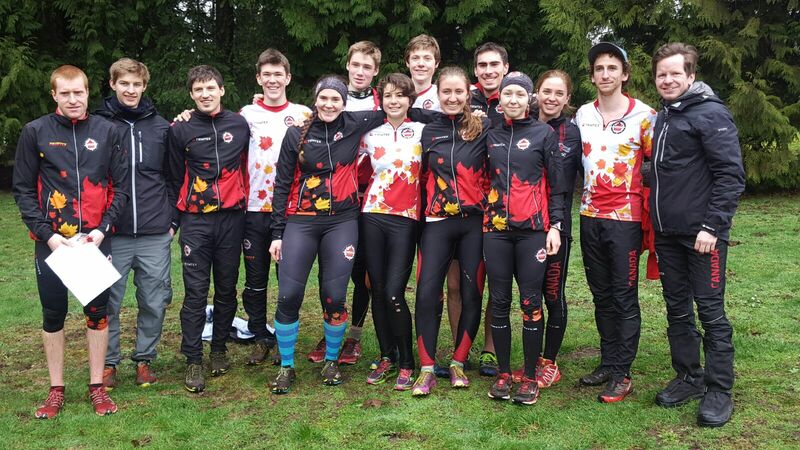 So far in 2016, I’ve competed in two weekends of racing: the Vancouver Sprint Camp and Desert Run. In both events, I did some things well and some things not so well. I had good races and not as good races. Since they’re at the beginning of the season though, I can learn a lot from them, particularly about where I can improve, and therefore what I should focus on during my training in the next few months leading up to more important races. As it has been a little while since both of these events, I’ve had enough time to reflect on them. I took this one too fast at the beginning. I was overly excited to run my first race of the year, and I wanted to have a speedy race. Unfortunately, this led me to be too imprecise in my planning. For example, going to control 2, I thought to myself something along the lines of ‘get onto the concrete part below the round building and take stairs down towards the control’. Because I wasn’t precise enough about which stairs to take, I started going down the wrong ones and ended up losing more time backtracking than I would’ve lost with another map glance and adding to the thought ‘the stairs at the end of the concrete bit’. There were also some other instances on the course where I made similar mistakes, but one thing I think I did well was my flow through the controls from 9 on wards. This makes me think my planning improved throughout the race. To prepare for the next races, I reflected on the race at Queen E Park and so my goals in the next couple of races were to plan in advance more completely. I think my orienteering certainly improved because of that goal. I learned to not let the hype of the races allow room for costly mistakes and that sometimes taking a couple seconds to look at the map can save more time than it took. Not surprisingly, I orienteered much better the last day of racing. This included two exciting races on the UBC campus (my home turf, currently). They were a set-up and chase format, with the chase being looped. I started the chase a bit easier because my calves had been bothering me and focused on clean navigation. 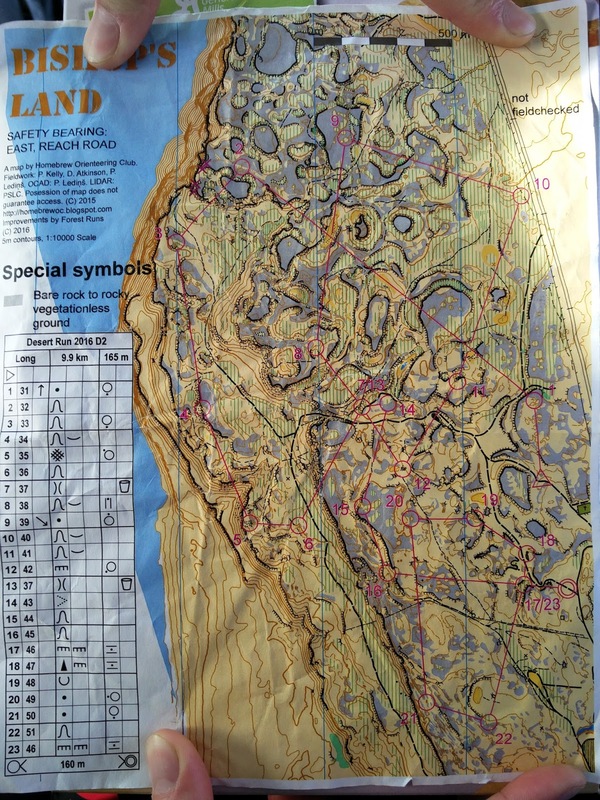 It was a mass start and the first loop went cleanly navigationally for me except for a bobble due to my misinterpretation of the map at 5 (there are stairs under the canopy). Then, after the first loop, I started accelerating, being pushed by the thought of running my best race (against the others who had started with me) but still being completely ‘in the zone’ and thinking about navigation. I ran all out until the end and finished with probably my best results of the weekend even though I’d taken the first part a little easy. Reflecting on things I didn’t do as well in the first races of the weekend allowed me to do better in the last ones. The second set of races that I attended a couple weeks later was Desert Run. 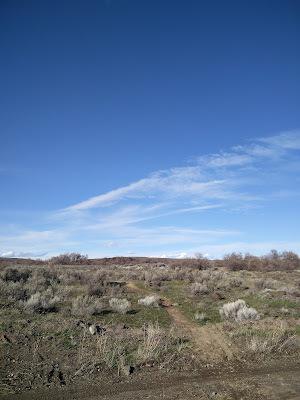 This was a two day event in eastern Washington State where I opted for the middle distance course the first day and the long course the second day (see Pia’s blog post about it here: http://teamcanadaorienteering.blogspot.ca/2016/03/a-bit-of-blue-sky.html ). The first day I really struggled with interpreting the terrain and rushed many of my first controls which caused me to have some poor route choices at the beginning and even to have to relocate once. Once I got into the map, after about the 7th control, things went a bit smoother. I think this demonstrates the usefulness of practicing on maps with similar terrain before big competitions. 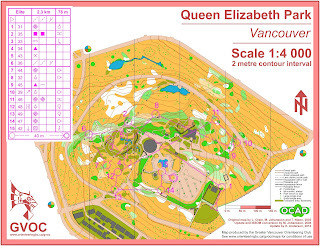 I had raced on some similar terrain before; some of the maps in the middle of BC have some similar features but that was a while go. Additionally, having not raced in a while, I should have taken the first control easier and worked on remaining calm and focused at the start of the race. I failed to do so that day. At control 6, I told myself to refocus, a skill l that I like to think I’m improving at, and things generally got better thereafter. I was very happy with my advance planning and route choice for the rest of the race, but not necessarily running speed until nearer to the end. 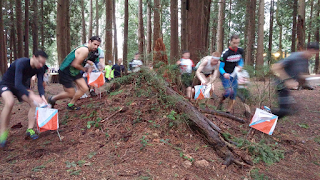 When I was approaching the 17th control, a bunch of fast orienteers caught up to me and my speed improved quite considerably. The seemingly head-to head racing made me run faster. Learning from this, I would like to try to always have the ‘you’re trying to beat this person now’ drive to go faster as long I'm in control navigationally. 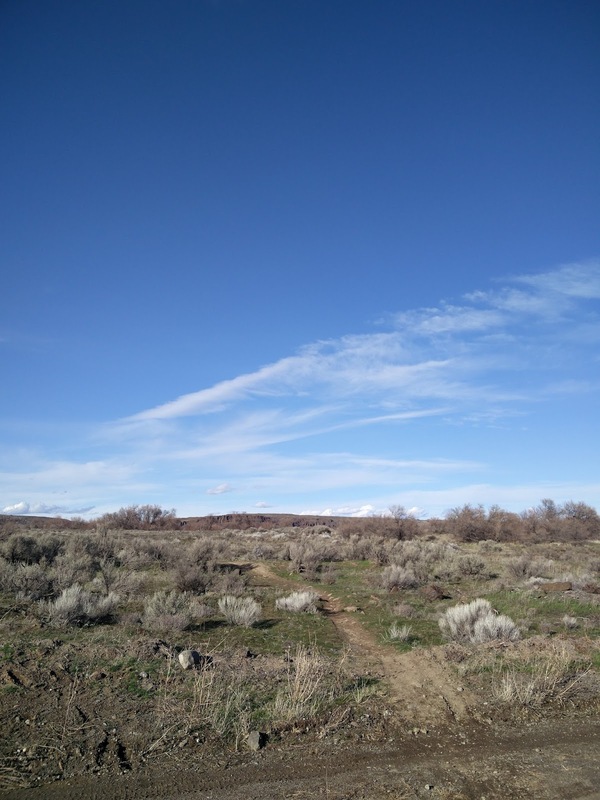 As an orienteer, although I don’t necessarily see the competition the entire race, its still there and should still push me to orienteer at the top of my ability for the entire race, not just when I see competition. 1. Don’t let the stress of the races cause you to go too fast at the beginning and make mistakes. 2. 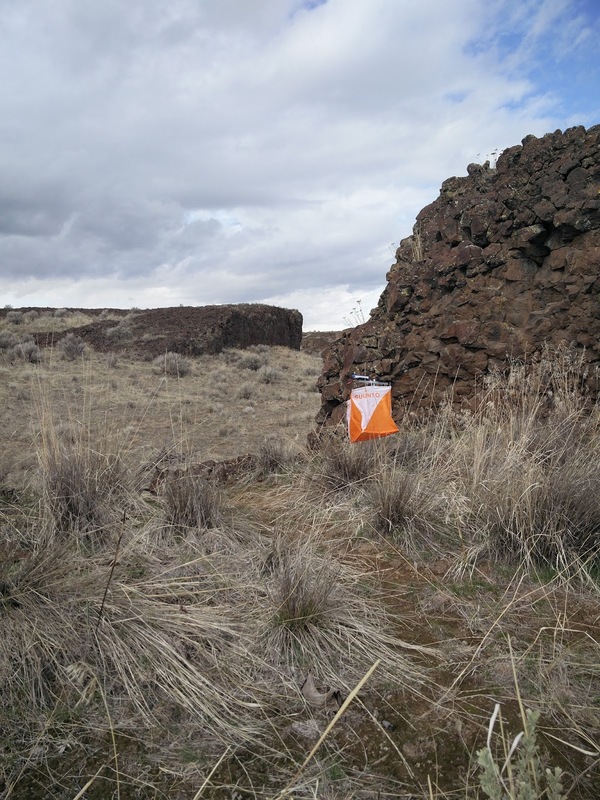 Taking a second to plan/ map read can save you from mistakes later. 3. 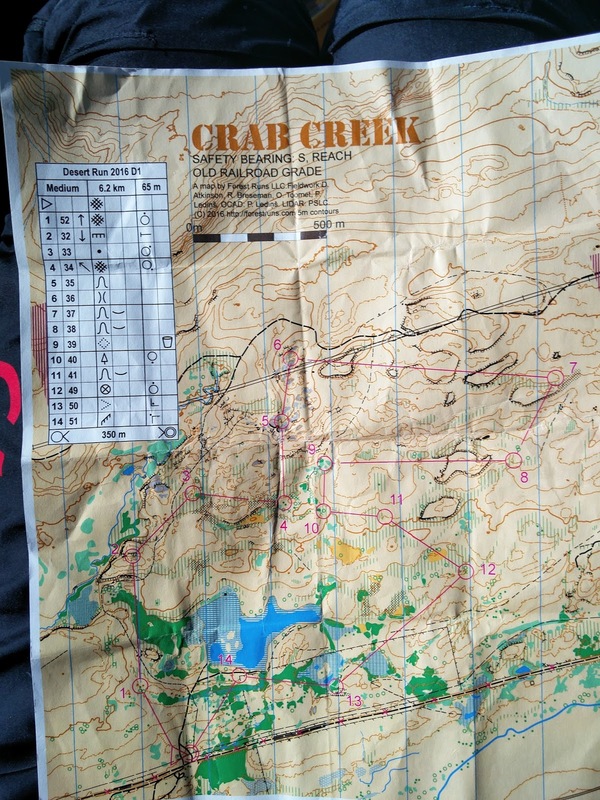 Remember it’s a race/ treat it like you’re always running against someone (but don’t neglect map reading because making mistakes loses more time than slowing down to map read). 4. Learn from mistakes made in the first races of the series to improve in the next ones. Although I’ve certainly all heard these things before, these races gave me real experience with those learning outcomes so that I myself believe them to be completely true and will work hard to avoid making mistakes like these in the future. After a couple months in Vancouver, I was hankering for some good old forest. This past weekend, I may have gotten off the sprint map, but not necessarily into woods. 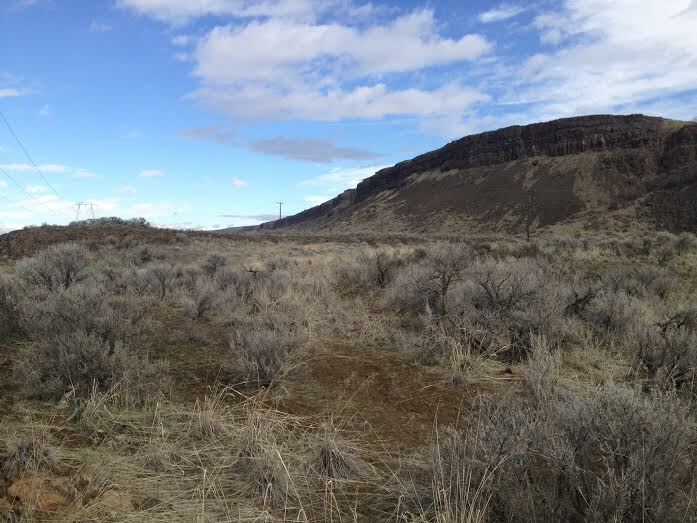 Instead, I got the chance to run on some one-of-a-kind terrain in Eastern Washington: grasslands! Saturday morning opened a bit chilly, but there was a gorgeous blue sky. The terrain was very open, with a couple of marshes near the finish, but the rest was grassland interspersed with little patches of trees. 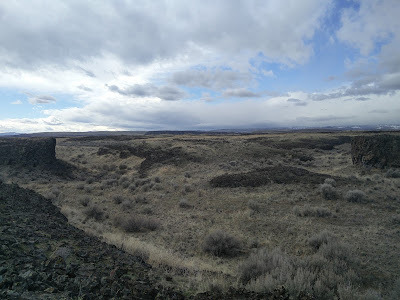 This meant that there was little in terms of route choice, but a lot of looking up and sighting ahead with the trick being to look for the big features. There were also some interesting rock features. Would you go north or south from 6-7? I felt pretty confident with my race. It was my first time in a while on a non-sprint map, so I took the first couple controls to get into the scale and the mapping. 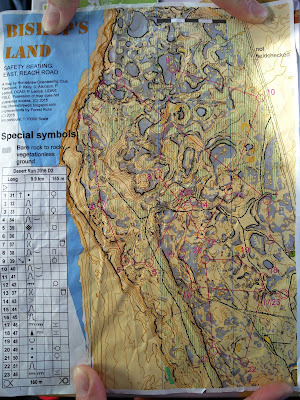 I found the contours to be sometimes difficult to read, so I ended up sighting up for cliffs and forest clumps: very helpful in keeping me in line. Day 2 was another gorgeous day, with some incredible natural walls that made for very interesting route choice. Like day 1, the terrain was very open, but unlike day 1 it was impossible to run in a straight line. This time, compass was of the utmost importance, as figuring out where you were after getting lost was made all the more challenging by a lack of distinct features. How would you go from 1-2? This race started out ok, and going to number 2 I decided to take a route that did not involve too many cliffs and direction changes. Fairly pleased with that leg, I made an error going to 3: I ended up coming off the cliffs in the wrong place, and as a result made a parallel error. From there, I decided to be extra careful, and rest of the race went by with relatively smooth sailing. Can you guess which control on the long course this is? A big thank you to all of the organisers - it was an amazing experience, and I am definitely looking forward to going back! Thank you too to the Woods for making it possible for me to get there.